Personal confessions of women forced to undergo sterilization. Forever. Performed on stage as well. I have two boys but I’ve always wanted a little girl too. I was sterilized when I was nineteen. I felt like a guinea pig. I will never feel like a woman again. Do you have questions on your mind? How could that ever happen? What role did the doctors play in it? What did the social workers do? How could the women let that happen? What was their life like after? And what was the position of their husbands? All these questions will be answered by women forced to undergo sterilization in a week-long workshop under the leadership of drama tutors. 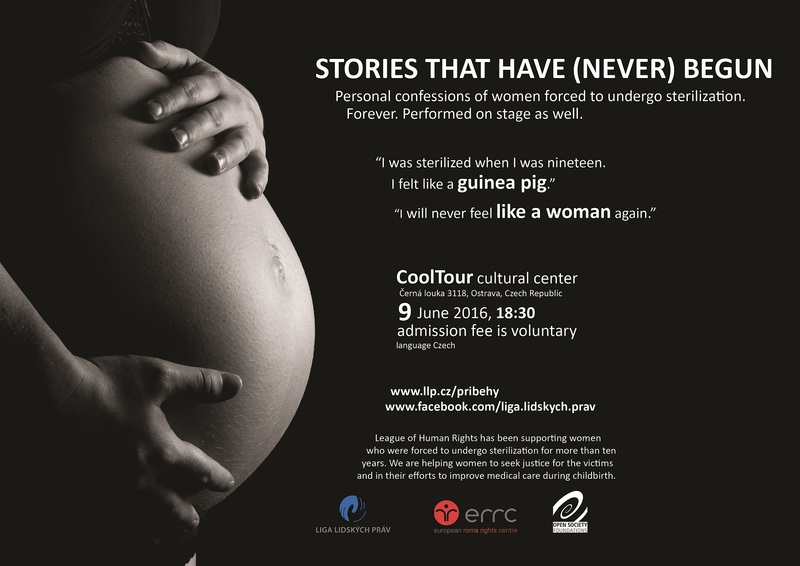 The women will dramatize their testimonies and will perform them for the first time in the theater CoolTour in Ostrava. Come to understand the women. Come to support the woman. When: 9 June 2016, 6:30 p.m.
League for Human Rights has been supporting wom en who were forced to undergo sterilization for more than ten years. We are helping women to seek justice for the victims and in their efforts to improve medical care during childbirth.